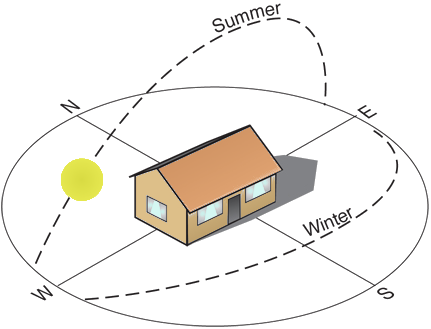 Tracking the Sun’s position over your property helps to determine how much sun or shade there is during the day and where the sun and shade are on your property during the day. You can track the sun by drawing a map of your property, then observing where the sun is in the sky at intervals such as 9:00 am 11:00 am, noon, 2:00 pm, 4:00 pm, etc. Then mark the areas on your map to show where the sun hits the ground and where shadows/shady areas show at each of those intervals. You’ll then have a very good idea of where to plant depending on sun/shade needs. Its a bit time consuming, but its worth it if you’re not sure where to plant. If you don’t want to take the time to map out your sun/shade areas, here are a couple of sun calculators that will at least show you the sun position, sun rays and shadows for your property on any particular date and time that you select. At the very least, you’ll be able to determine where your early morning and afternoon sun are likely to hit. Play around with them; it’s kind of fun. thanks for the feedback. I’m glad you found the information helpful. Thanks for the feedback. I’m fairly new to blogging as well. My only advice is to let your personality show through in your writing, and people will respond and appreciate it. Thanks for the comments. I used a wordpress theme and then customized it. Im glad you like the site. to contribute to the conversation. Usually it is triggered by the fire communicated in the article I read. And on this article Sidebar: Sun Calculators | dirty words garden. I was actually excited enough to drop a thought 😉 I actually do have a couple of questions for you if you don’t mind. Could you list every one of your social sites like your Facebook page, twitter feed, or linkedin profile? Hi there – I post at this site only, and it shares to Tumblr, Facebook and twitter; I sometimes post a short blurb on instagram as well, which will show up on my site. Thank you so much for your comments and thanks for reading/commenting. really well written article. I’ll be sure to bookmark it and come back to read more of your useful information.